Emilie de Vialar was born in 1797 to a rich and distinguished family in an ancient town in the south of France called Gaillac, not far from Toulouse. Her paternal grandfather was a magistrate, and Emilie’s own father, an educated man, held important administrative positions in Gaillac. Her maternal grandfather, Baron de Portal, belonged to a family of pharmacists, and became physician to both Kings Louis Philippe and Charles X. Her mother was a devout woman, and educated Emilie in the faith from her earliest years. Just at the time Emilie was due to attend boarding school in Paris her mother died. After two years there, during which time she made her First Communion, her father called her home to take charge of the household and be his companion at social events. Emilie’s presence at home was greatly resented by a jealous and interfering housekeeper who made her life almost intolerable over the years, misrepresenting her to her father in many different ways. Emilie bore this constant suffering and unpleasantness with patience and resignation. Another specific grace encouraged Emilie to make the decision to devote her life entirely to God and to always accomplish his will. She spent considerable time in prayer in the privacy of her room and made many clandestine visits to the church, which was another cause for dissension between herself and her father. There were also many arguments when she dismissed several young men who sought her hand in marriage. As she matured she gradually formed the idea of founding a Congregation so that the sick and poor could have constant care and attention day and night. In 1832 her maternal grandfather died and she received a substantial legacy; with this independence she was able to set about bringing her plans to fruition. “Although for twenty years, my life in my father’s house was so painful that only the consideration of fulfilling God’s will gave me the strength to remain there, nevertheless, it cost me greatly to determine to leave my father on account of the grief I knew the separation would cause him. I left my father’s house to found in my own town the work I believed to be advantageous to the interest of God’s glory and the well-being of others less fortunate.” [ibid] In the evening of Christmas Day 1832 after leaving a long affectionate letter for her father, and arranging for her younger brother’s wife to be attentive to his needs, she left with three companions to set up the fledgling community that was to spread far and wide within her lifetime. Within six months the little group had increased to twenty-six. Emilie next sought and obtained the approval of the district Archbishop, Mgr de Gualy of Albi. Within a few more months he approved the Rule of the Congregation. Besides providing relief for the poorer classes with soup, linen and remedies, caring for the sick and aged in their homes, the sisters also saw to the free education of children. There was much criticism and malicious gossip in the small town, but the sisters carried on regardless. In 1833 Emilie’s brother Augustin, who had been among the first French settlers to colonise Algeria, suggested that she send some of her sisters to the capital, in particular to staff the hospital just being built. This was Emilie’s chance to put into action a long held dream to work in mission countries. The following year an official request came from the Municipal Council of Algiers for staff for the hospital. Emilie accompanied the three sisters chosen to begin this missionary work, arriving in Algiers in August 1835, – in the midst of a cholera epidemic. Muslims, Jews, Europeans were all affected and all received the same unselfish care and nursing without distinction. By the end of 1836 there were twenty sisters at work on this mission, Emilie having purchased buildings with a view to future needs. The Congregation of the Sisters of St Joseph of the Apparition as Emilie called it steadily increased in membership and Mgr de Gualy advised Emilie to go to Rome to apply for official approbation of the Institute. However, at this time, an untenable situation was unfolding in Algiers. The newly appointed Bishop Dupuch, at first, most welcoming to the sisters, soon took on a domineering and possessive attitude, trying to enforce changes to the Rule and Constitution that would limit the Congregation to service in his diocese only. He even went to such lengths as to excommunicate the sisters, depriving them of the sacraments. Emilie’s vision was much broader than this, and before leaving for Rome she had established five sisters in a new foundation in Tunis. 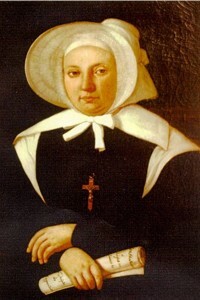 She was received by Pope Gregory XVI in December 1840 and subsequently spent eighteen months in Rome waiting for the cardinals to study her case, which included denunciations and vilifying reports from Bishop Dupuch. During her absence in Rome, matters in Algiers deteriorated greatly. She took the opportunity of her stay, to establish a house there, bringing three sisters from Gaillac to nurse the sick and educate the children. Having at last received the Laudatory Decree of Approbation in May of 1842, Emilie hurried to be with her sisters in Algeria. Under pressure from the Bishop the French Government had decreed that the sisters must leave Algeria, after eight years of selfless service to the colony, and this took place at a moment’s notice. Resourceful woman that she was, Emilie soon had these valiant missionaries deployed in other foundations where they continued to carry out their works of mercy. It is to be noted that the bishop later regretted his actions and sought forgiveness from the woman he had maligned. To add to this there was much legal wrangling over her properties in Algiers, the French Government disputing her ownership, to the extent that ultimately she received no remuneration for the large amounts of money she had expended in the colony. Then her sister-in-law, Augustin’s wife, fell ill and died at the age of twenty-seven, leaving two little girls aged two and eighteen months, for whom Emilie felt great responsibility. From the time of the inception of the Congregation until 1844, Emilie had made fourteen foundations, all of which drew heavily on her fast disappearing funds. While she was attending to the problems in Algeria, travelling to new locations and biding her time in Rome, she had left her financial affairs in the hands of a sister whom she felt she could trust, and a businessman recommended by the parish priest. This trust was found to be misplaced; records were falsified, pages were missing from accounts books which Emilie herself had kept so diligently, money was embezzled and Emilie was embroiled in a most unpleasant court case. Between 1847 and 1851 there were about ten hearings, the final verdict being given against Emilie and she was left penniless and in debt. Such was the animosity and ill-feeling in Gaillac, that besides quite a number of sisters deciding to return to their families, classes were boycotted and Emilie with her remaining faithful sisters could no longer continue in the place. It was 1847 the sisters had to leave Gaillac under cover of darkness travelling through the night, and arriving in Toulouse at dawn. She sought refuge in Toulouse, but spiteful gossip had preceded her. The presence of the sisters was merely tolerated by the inhabitants and they found themselves with no means of support. They lived in dire poverty in this place, even having to join queues at the soup kitchen. Once again difficulties with the hierarchy surfaced; Bishop d’Astros of Toulouse wanted to make himself the Superior General of the Congregation, and the priest appointed to it, wanted to administer the finances of the Institute in his own way. By 1852, Emilie had decided that living in Toulouse was no longer an option, so she began to look further afield. She decided on Marseilles, the port in which took place all the arrivals and departures of her missionaries. After five years of privation, humiliation, disappointed hopes, physical and moral suffering, Emilie at last met an understanding and friendly advocate in the person of Mgr de Mazenod, Bishop of Marseilles, and founder of a missionary order of men, the Oblates of Mary Immaculate. Finances were still a problem for her and it was some time before the sisters were able to count on a steady income from their work. She was to write in 1855, “Had I not become poor I would not have been able to establish the Congregation.” [Letter to Sr Eugénie Laurez 3 Jan 1855]She was fifty-five and now at last was able to experience some peace and stability in her life. During all those troubled times requests for sisters in missionary countries were numerous and Emilie still found time to establish new houses, and those already existing were flourishing. How did she cope with so many anxieties, trials and disappointments, so much opposition and heartbreak? Through her prayer and spiritual life she had developed a very close relationship with God, who favoured her with intimate graces and support. She had learnt to depend totally on the Providence of God and such was her faith and confidence that she was able to function, secure in the knowledge that she was following God’s will. She was thirty-five before she felt she had finally discerned what God wanted her to do with her life in his service. From then on she pursued her task with untiring zeal, courage and perseverance. Her comparative peaceful existence in Marseilles was not to last for long. In mid August of 1856 Emilie was taken ill, and at first her illness was thought to be cholera. The doctor had difficulty making a diagnosis, but managed to relieve the pain. She gradually worsened and within five days, on 24th August, she died peacefully, surrounded by her Sisters and her nieces. It was only after her death that it was realised that her illness was a strangulated hernia which she had sustained many years before. As a young woman, while attending to the poor on the terrace of her family home she had dragged a large bag of flour up the steps to the terrace, and that had caused the damage. She had suffered intermittently from this act of charity all her life. The funeral service was conducted with the greatest simplicity, and sorrow was tinged with joy, as the life of this valiant woman had been a gift from God to her Sisters. At her death she was almost fifty nine, and during the brief period of twenty four years that her Congregation had been in existence she had supplied missionaries for countries as varied as Algeria, Tunisia, France, Italy, Cyprus, Malta, Syria, Greece, Burma, Palestine, Turkey, Crete and Australia, having made forty two foundations in all. Her sanctity was officially recognised by the Church when she was canonised on 24 June 1951 by Pope Pius XII. Her Feast day is celebrated on 17th June.